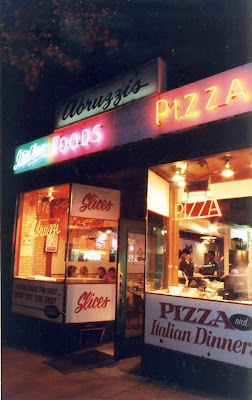 Rick went to Abruzzi’s one last time, in 1994, the last week it was open. “I brought a pizza home and froze it. It was in my freezer for four months and then I couldn’t stand it any more, I missed that taste too much, so I ate it. I thought I’d keep it for posterity. When it was torn down, Nick was thinking about relocating, then he got ill and died of cancer,” he recalls. “I’ve been to many pizza places since then, but it’s a flavor — their plain cheese and sausage pizza — that was just phenomenal.” And that, said Rick, was that. Until a couple of weeks ago when his wife was looking through some ads in the paper. So, anybody else out there have fond memories of Abruzzi’s? Let’s hear ’em. Then do as Rick suggests, and get yourself down to Normandy Park. Mary Lou has a pizza with your name on it.